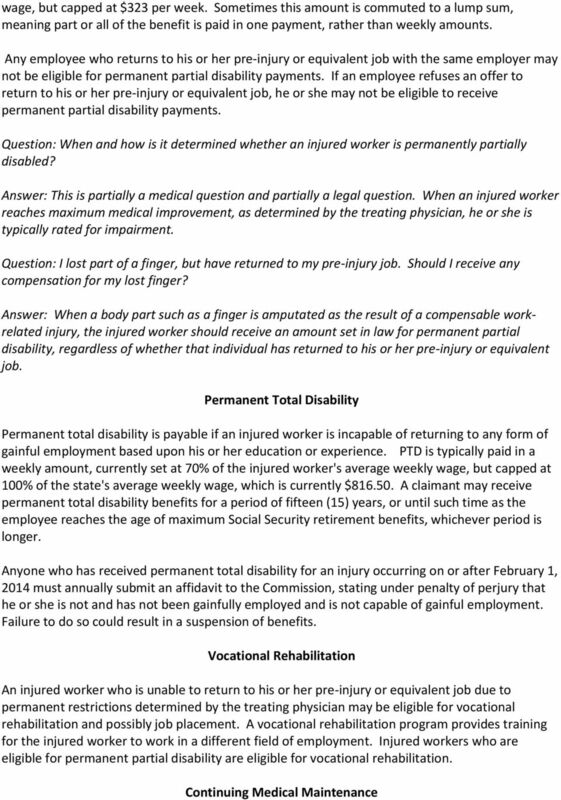 Download "Guide for Injured Workers"
2 Vocational retraining and/or job placement for workers' who are unable to return to their prior occupation; Question: Who is covered by the Administrative Workers' Compensation Act? 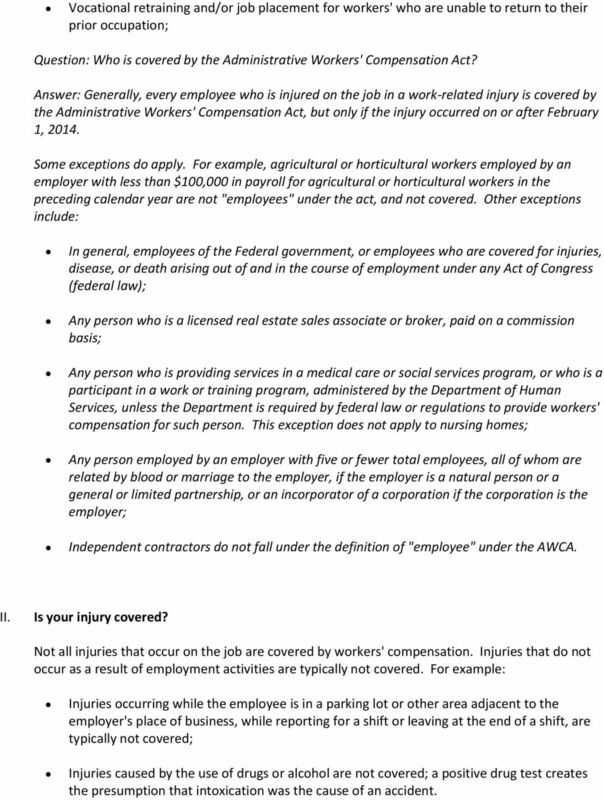 Answer: Generally, every employee who is injured on the job in a work-related injury is covered by the Administrative Workers' Compensation Act, but only if the injury occurred on or after February 1, Some exceptions do apply. For example, agricultural or horticultural workers employed by an employer with less than $100,000 in payroll for agricultural or horticultural workers in the preceding calendar year are not "employees" under the act, and not covered. 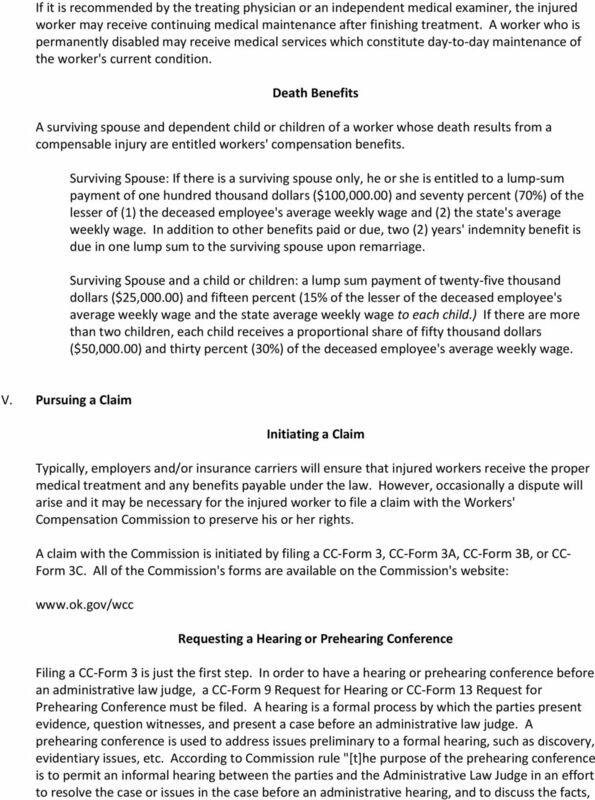 Other exceptions include: In general, employees of the Federal government, or employees who are covered for injuries, disease, or death arising out of and in the course of employment under any Act of Congress (federal law); Any person who is a licensed real estate sales associate or broker, paid on a commission basis; Any person who is providing services in a medical care or social services program, or who is a participant in a work or training program, administered by the Department of Human Services, unless the Department is required by federal law or regulations to provide workers' compensation for such person. This exception does not apply to nursing homes; Any person employed by an employer with five or fewer total employees, all of whom are related by blood or marriage to the employer, if the employer is a natural person or a general or limited partnership, or an incorporator of a corporation if the corporation is the employer; Independent contractors do not fall under the definition of "employee" under the AWCA. II. Is your injury covered? Not all injuries that occur on the job are covered by workers' compensation. Injuries that do not occur as a result of employment activities are typically not covered. For example: Injuries occurring while the employee is in a parking lot or other area adjacent to the employer's place of business, while reporting for a shift or leaving at the end of a shift, are typically not covered; Injuries caused by the use of drugs or alcohol are not covered; a positive drug test creates the presumption that intoxication was the cause of an accident. 3 Injuries incurred while engaging in recreational or social activities for the employee's personal pleasure are not covered; Injuries caused by pre-existing conditions are not covered when there has been no significant and identifiable aggravation in the course and scope of employment; Injury is not covered if it occurred while the employee is on a work break, unless the break is authorized by the employee's supervisor and the injury occurs inside the employer's facility; Cumulative trauma injuries where the employee has not been employed by the employer for at least one hundred eighty (180) days. Mental injuries are only compensable if caused by a physical injury to the employee; this limitation does not apply to the victim of a crime of violence. Question: Are volunteers of any type covered? Answer: Yes. Any member of the Oklahoma National Guard performing duties in response to state orders and any authorized voluntary or uncompensated firefighter, peace officer or emergency management worker may be covered. Benefits for volunteer workers who are covered are calculated by using wages earned in the individual's regular occupation. III. What are your rights and responsibilities as an injured worker? You have the right to receive assistance from the Workers' Compensation Commission's Counselor program, if you are not represented by an attorney. The Counselors are available to assist if you have questions about the workers' compensation process, laws, or rules. 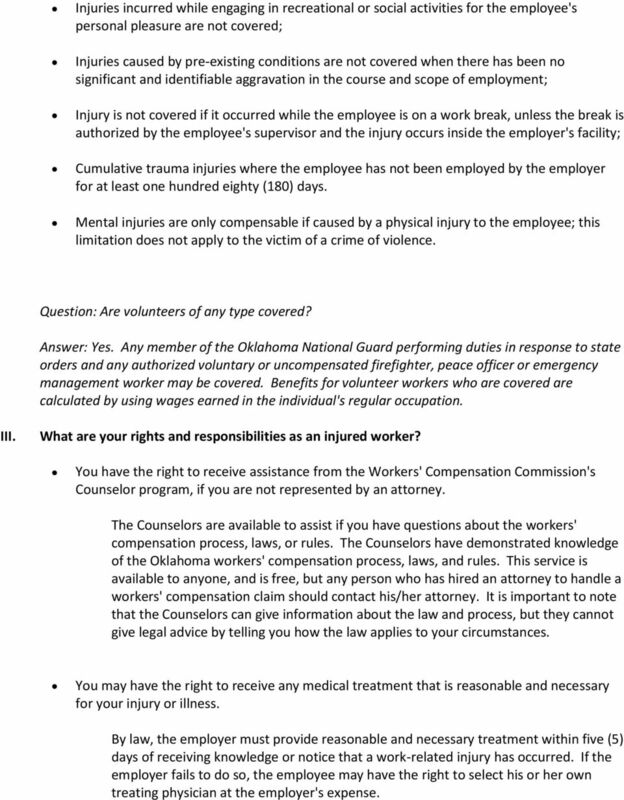 The Counselors have demonstrated knowledge of the Oklahoma workers' compensation process, laws, and rules. This service is available to anyone, and is free, but any person who has hired an attorney to handle a workers' compensation claim should contact his/her attorney. It is important to note that the Counselors can give information about the law and process, but they cannot give legal advice by telling you how the law applies to your circumstances. You may have the right to receive any medical treatment that is reasonable and necessary for your injury or illness. 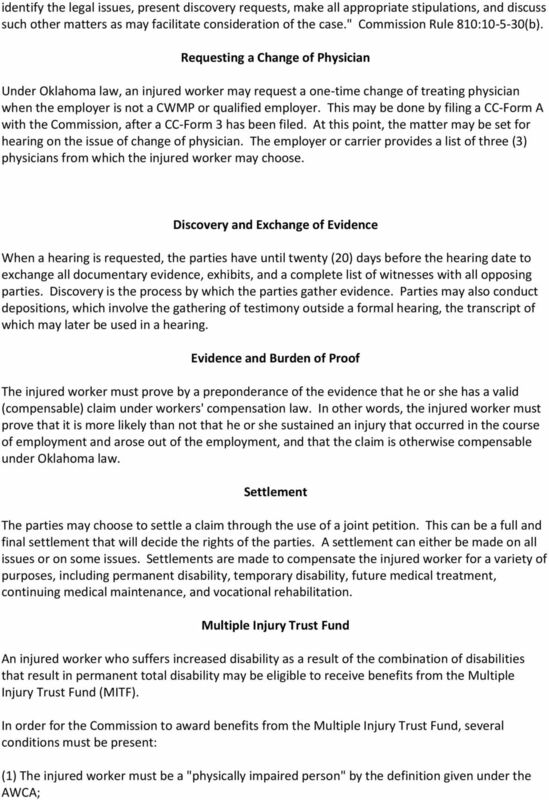 By law, the employer must provide reasonable and necessary treatment within five (5) days of receiving knowledge or notice that a work-related injury has occurred. If the employer fails to do so, the employee may have the right to select his or her own treating physician at the employer's expense. 4 IV. 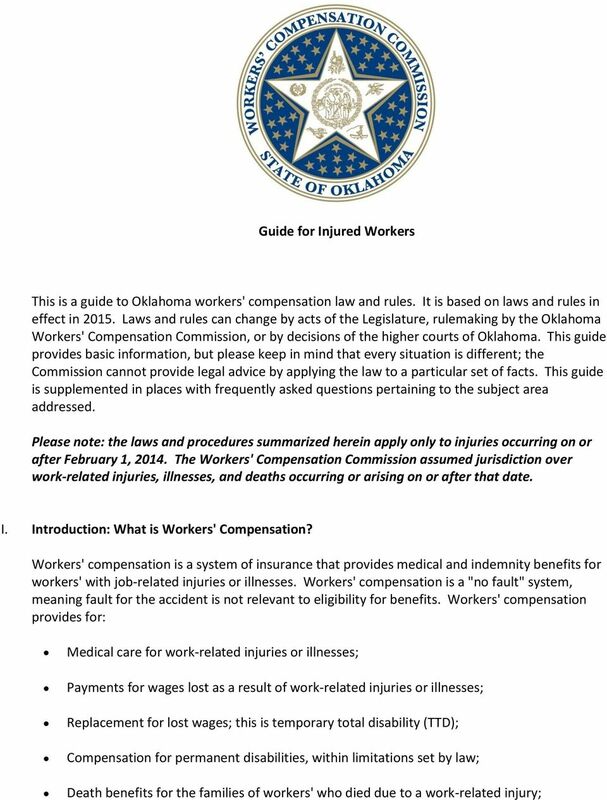 Benefits Medical Treatment For a work-related injury that is compensable under Oklahoma law, an employer should provide reasonable and necessary medical treatment within five (5) days of notice or knowledge that an injury to an employee has occurred. The employer has the right to choose the treating physician. If the employer fails to provide reasonable and necessary treatment within five (5) days of notice or knowledge, the employee may choose his or her treating physician. Question: Can I change doctors? 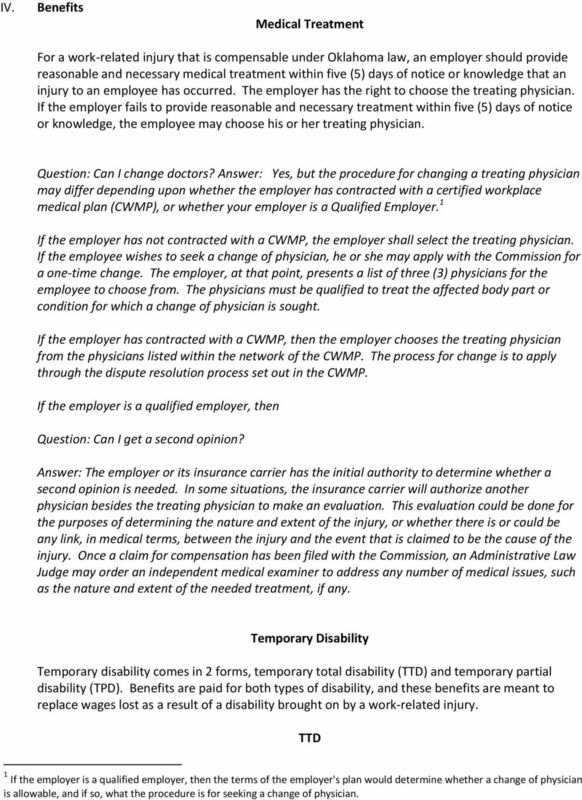 Answer: Yes, but the procedure for changing a treating physician may differ depending upon whether the employer has contracted with a certified workplace medical plan (CWMP), or whether your employer is a Qualified Employer. 1 If the employer has not contracted with a CWMP, the employer shall select the treating physician. If the employee wishes to seek a change of physician, he or she may apply with the Commission for a one-time change. The employer, at that point, presents a list of three (3) physicians for the employee to choose from. The physicians must be qualified to treat the affected body part or condition for which a change of physician is sought. If the employer has contracted with a CWMP, then the employer chooses the treating physician from the physicians listed within the network of the CWMP. The process for change is to apply through the dispute resolution process set out in the CWMP. If the employer is a qualified employer, then Question: Can I get a second opinion? Answer: The employer or its insurance carrier has the initial authority to determine whether a second opinion is needed. In some situations, the insurance carrier will authorize another physician besides the treating physician to make an evaluation. This evaluation could be done for the purposes of determining the nature and extent of the injury, or whether there is or could be any link, in medical terms, between the injury and the event that is claimed to be the cause of the injury. Once a claim for compensation has been filed with the Commission, an Administrative Law Judge may order an independent medical examiner to address any number of medical issues, such as the nature and extent of the needed treatment, if any. 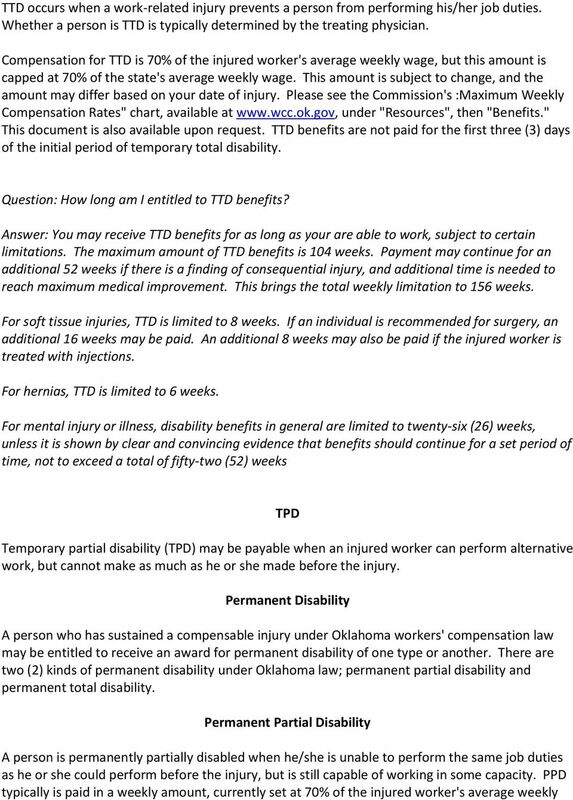 Temporary Disability Temporary disability comes in 2 forms, temporary total disability (TTD) and temporary partial disability (TPD). Benefits are paid for both types of disability, and these benefits are meant to replace wages lost as a result of a disability brought on by a work-related injury. TTD 1 If the employer is a qualified employer, then the terms of the employer's plan would determine whether a change of physician is allowable, and if so, what the procedure is for seeking a change of physician. 9 (2) The injured worker must have sustained a subsequent compensable injury and received an adjudication through the Workers' Compensation Commission or Workers' Compensation Court for the most recent injury. (3) The combination of the prior disability and subsequent, work-related disability must have resulted in permanent total disability as defined by law. Any adjudication of preexisting disability to a part of the body is not combinable for purposes of the MITF unless that body part was deemed to have been injured in the (present) claim being adjudicated. The compensation rate for permanent total disability awards from the MITF is the compensation rate for permanent partial disability paid by the employer in the last combinable compensable injury. Welcome to the West Virginia Workers Compensation Webinars!